The move into 2018 is going to come with a shift in mobile marketing. As new trends enter the marketplace, your company needs to focus on the top mobile marketing trends. 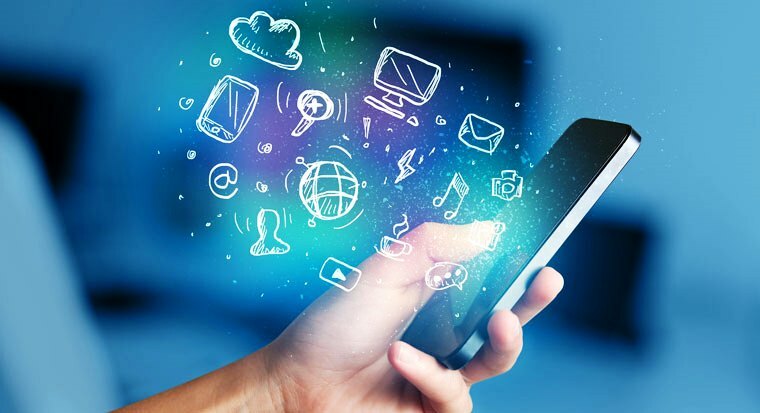 The mobile marketing of tomorrow is going to offer great advancement in new technologies as consumers seek for an integrated mobile experience. We saw new technologies like iPhone X and Google Home in the year 2017. There are a number of mobile marketing trends that are poised to make a great impact on marketing strategy in 2018. Mobile marketing is seeing some major changes and companies are preparing themselves to the new marketing strategies. Mobile apps are the main reason behind the increasing demand of mobile marketing. User base has increased significantly compared to previous years, as a result of which mobile marketing trend has prospered. Here are some of the important mobile marketing trends to look for in 2018. Voice search will surely change the customer experience as well as the future of mobile marketing. Voice search is highly beneficial for marketers, as it helps them understand and serve target audience in a better way. Google has been improving its algorithm constantly as per the search intent of the target audience. More than 25% of the queries are based on voice search, which is going to increase in future. Voice search is huge with mobile and hence you should make sure that your app is mobile friendly in terms of search. Though the idea of live streaming has been around for years, the mobile marketing trends in 2018 are going to come up with innovative streaming. Mobile marketing in 2018 may witness user generated content with high quality video. Today, live streaming has become an important aspect of every business strategy with creative ideas through mobile app marketing. It is estimated that by the end of 2018, videos will account for 80% of the mobile data traffic. Live streaming highlights the role of visuals in attracting users and keeping their attention. Mobile marketing trends are going to see mobile sites with high-quality performance. Users will be able to access the web page on mobile quickly, which will speed up other processes. The high speed of mobile sites will surely boost the revenue generation of several companies. This change will affect the mobile app marketing as well as advertising in 2018. The speed of mobile sites is certainly a benchmark in mobile marketing trends. Delay in page load is one of the quickest ways to turn users away, as more than 55% of users leave the site if it takes more than 3 seconds to load. Mobile apps will have to make sure that they are optimized for easy user experience. As technology is growing at a fast pace, users are feeling less secured about smart devices and their personal data. Mobile app developers have addressed the root cause of security problems. Securing the device is one of the primary concerns in 2018, as a result of which new mobile security trends will focus on individual protection of the devices. The future of mobile security is trusted by most of the organizations. There have been tremendous advancements in app security. It is estimated that by 2018, there would be more apps with built-in security features. Augmented Reality is becoming highly popular these days and is going to surprise users with innovative features in 2018. AR and VR trends have gained a greatdemand as they combine digital information with real time environment and provide 3D content with physical objects in real world on mobile device. Artificial intelligence is going to be a big thing in 2018. AI is nothing but the power of machine to copy human intelligence. Google assistant is one of the best examples of AI technology. It is going to be a boon in new mobile marketing trends. AI based mobile apps are expected to grow on a higher level in 2018 to fuel the user growth. Users will expect instantaneous results on their personalized behavior and it is possible through AI. Internet of Things (IoT) is capable of providing integrated marketing opportunities. It creates an experience to merge physical and digital world, which is far beyond the limits of personalized messaging. We all know that customer experience is very important and it will increase through right message at right time and place. IoT is a great thing for marketers to send out structured messages to target user groups. IoT is providing limitless opportunities for marketers to fulfill the needs of target audience. It is estimated that IoT will be included in more than 90% of new mobile apps, creating a huge opportunity for marketers to interact with consumers. Mobiles are considered as the most powerful devices that drive a massive impact on end users. Viewing videos on mobile devices is much impressive and less distractive. The mobile advertising trends are going to overwhelm the internet population in 2018. Mobile video marketing is the latest trend in mobile marketing, as it creates urge of moment experiences. Mobile videos are going to influence customers and take a decision to make a purchase. It is estimated that by 2018 people will spend nearly 30-40 minutes daily watching videos on their mobile devices. Investing in mobile video content is the best way to engage with your audience. There are many unknown mobile marketing surprises that are waiting in 2018. Some of the above predictions may fail due to the ever changing expectations of consumers. 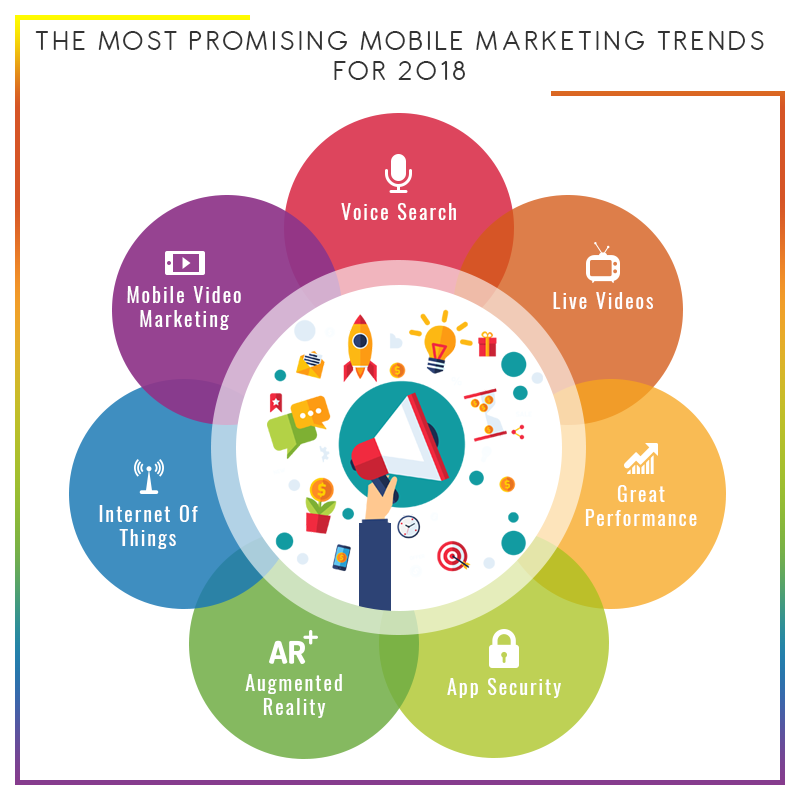 Mobile marketing trends in 2018 are likely to become analytical and focused on digital marketing strategies. New technologies like AR and AI will probably go mainstream in the increasingly crowded landscape. The rewards are always there for those who are brave enough to follow the above mobile marketing trends in 2018. It is estimated that mobile app development will cross new barriers in 2018 and bring new way for businesses to interact with customers.